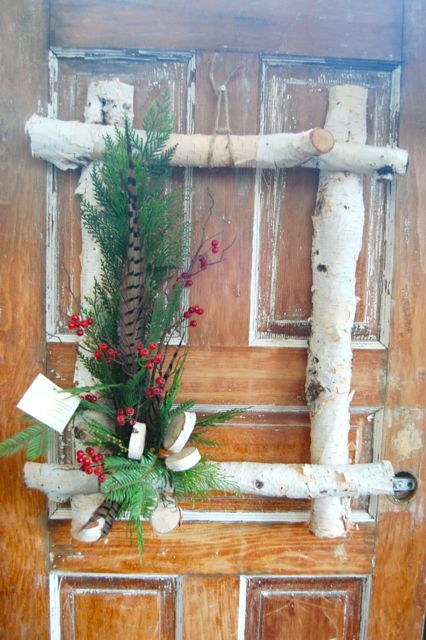 Some inspiration for front door décor from the Royal Botanical Gardens in Burlington. Their display of 100 decorated doors continues till December 10th. The RBG is only about an hour’s drive from Toronto, and if you haven’t visited in a while (I hadn’t till a Garden Writers’ Association conference took me there on Friday) you’ll be surprised. The new atrium facility provides cold-weather exhibition space for events like these. Who says wreaths have to be round? Not only does the one above defy conventional shape, it includes birch ring flowers and what looks like pheasant feather foliage. Love the door, too. I also like this simple idea for displaying a limited amount of greenery. It’s actually the bottom half of a double-decker decoration (or… double-decker-ation). 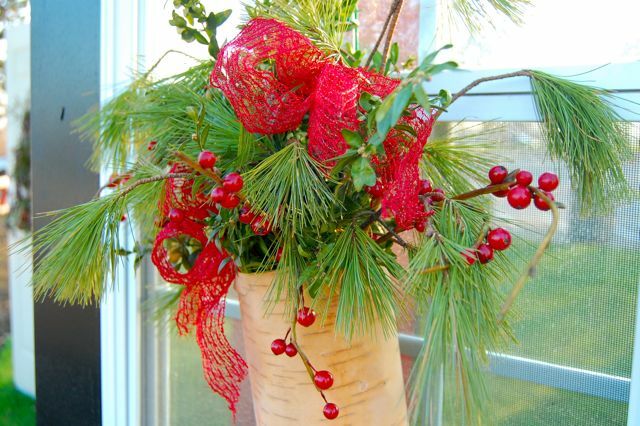 No need to use birchbark if it isn’t available… perhaps get out the glue gun and wrap a container in ribbon. While this wreath doesn’t photograph well, it looks quite nifty in real life. 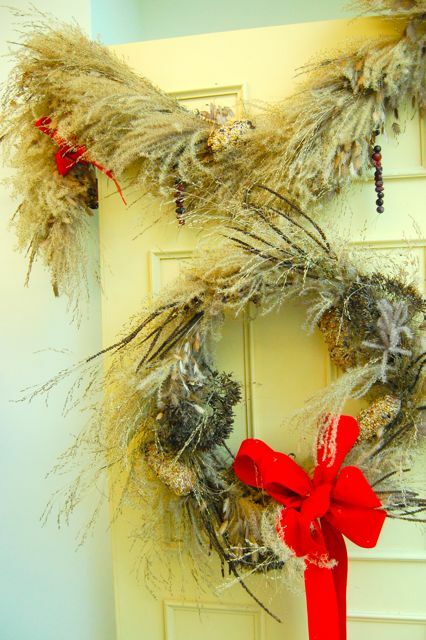 Grass seedheads like Miscanthus and Panicum along with what might be Eupatorium and spiky Veronicastrum in both the wreath and garland make a feathery, naturalistic display. Nestled here and there are feed-seed clusters for the birds. Pretty and delicious. Might have chosen a different ribbon, though. How about one cut from strips of newspaper? That fits with the compostable theme. This has to be my favourite, and it’s the only one for which I had the good sense to note the designer: William Kolomas of the RBG’s Horticulture Department. Do you see what it’s made of? Hinges! 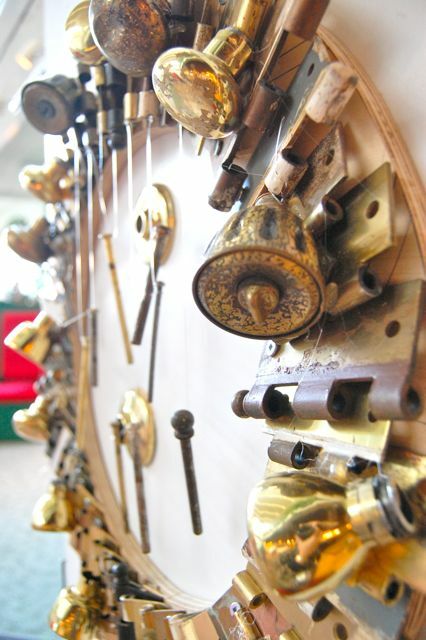 Hinges, doorknobs and the pins that hold the two halves of hinges together (lynchpins?). Very neat idea. If you look very closely you’ll see an inadvertant self-portrait in the knob on the lower right. 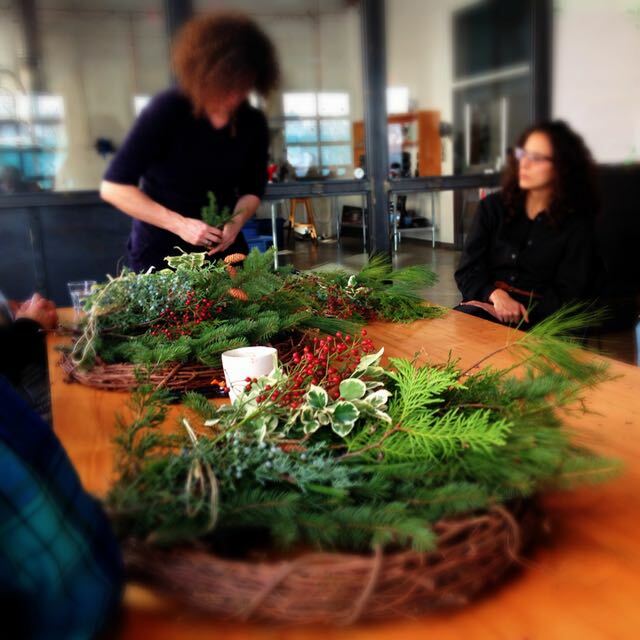 Friday’s event supplied a few ideas for posts, giving me fodder for the lean winter months. Meanwhile, perhaps I’ll dust off my red feather wreath — the one I fashioned out of a Hallowe’en boa from Village des Valeurs a couple of years ago — and give it an update. Very original, especially that last one. Great minds think alike, Helen. Sarah Richardson made a lovely wreath out of a Boa the other day, too. Well, those doorknobs certainly remind one of bells. Love it! Hi Helen, Thanks for stopping by my blog. "Unbe-leaf-able"–ha, that's hilarious!!! I love the RBG though I haven't been there in maybe 10 years. 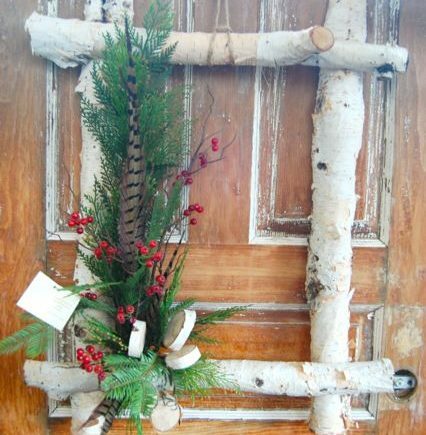 Love the door decorations and yes, love the hinge wreath–what a great way to use found objects or what would otherwise be trash. A friend once made a really nice wreath out of used prescription pill bottles!! Thanks for sharing! I was just giving the lemon branches the "eye" and thinking I might have to combine pruning and decorating this year. Square and rectangular wreaths are very trendy now, it seems that is what everyone wants to buy. I love the frame of the birch logs, very clever. Thanks for this post. II especially like the the first and last ones shown. They have given me some ideas for year-round wreaths, too. These are beautiful! My favorite is the first one. Nice to see some unique ideas. Neighbor's birch tree may not be safe now…. OOOhhhhhhh the hinge wreath is sooo yummy!! Can't wait to see what mum and I cook up for our door this year! 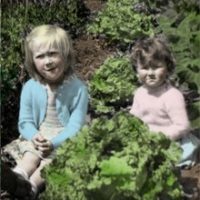 Have you considered an edible hedge?